When you book a tour to the famous Pak Ou Caves, it will almost always come in a package with a stop at Ban Xang Hai, the local "Whisky Village" just outside of Luang Prabang on the banks of the Mekong River. The Whisky Village and the nearby Pak Ou Caves sit just around 30km north of Luang Prabang. Even if you are only interested in visiting the caves, you can't really escape a stop at the Whisky Village. A visit to the village includes free shots of strong Lao whisky, the chance to buy lots of traditional handicrafts, and a short stop to explore the village. Is it worth it to visit the Whisky Village in Luang Prabang? Is the lao-lao rice whisky any good? Is it even safe to drink? Read on! 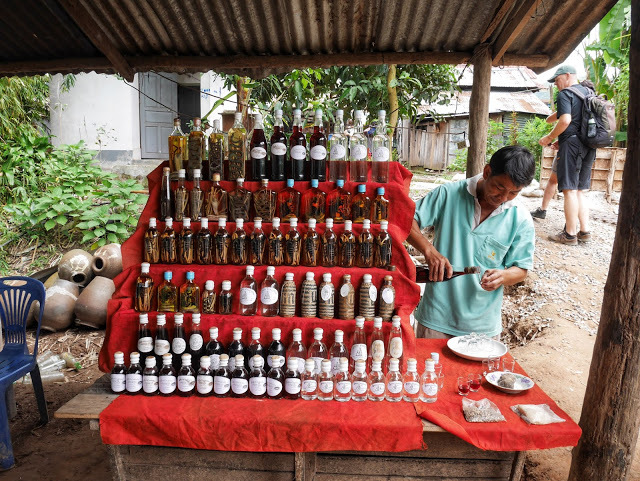 A man pours traditional Lao whisky for tourists to try at the Whisky Village near Luang Prabang, Laos. I booked a half-day tour to the Pak Ou Caves, including a visit to the Whisky Village, from one of the many our booking offices lining the streets of Luang Prabang. No matter where you book from, the package tour will be more or less the same. This is what it's like to visit the Whisky Village. The tour departed by rickety wooden boat from the dock at Luang Prabang just past 9:00 in the morning. 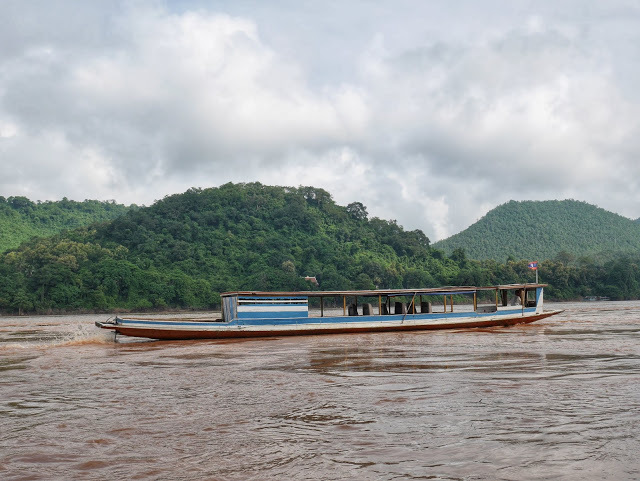 It was a sleepy ninety-minute journey along the slow-moving Mekong River, and eventually we arrived at Ban Xang Hai, the famous Whisky Village. While disembarking from the narrow longboat, hardly before stepping off of the rickety wooden plank that led to the village, a local man shoved a glass of red rice wine into our hands. “Free whisky! Try it for free!” he encouraged us to give it a taste. I took a sip of the dark red drink. It was surprisingly smooth and a bit sweet. “It’s good”, I told him honestly. The old man handed me a thimble-sized glass of a clear white liquid. The Spanish guy next to me raised his glass, and we clinked them together. I took a sip. I felt like I had been punched in the nose, and from the looks of things, so did my new Spanish drinking buddy. “Wow.” was all he said. The strong one… no kidding! There’s no pressure to buy any of the whisky, although you have plenty of opportunities to do so at the Whisky Village. A small bottle of the 15% rice wine or the 100-proof Lao moonshine will only set you back 15,000 to 30,000 kip. It’s incredibly cheap if you are brave enough! 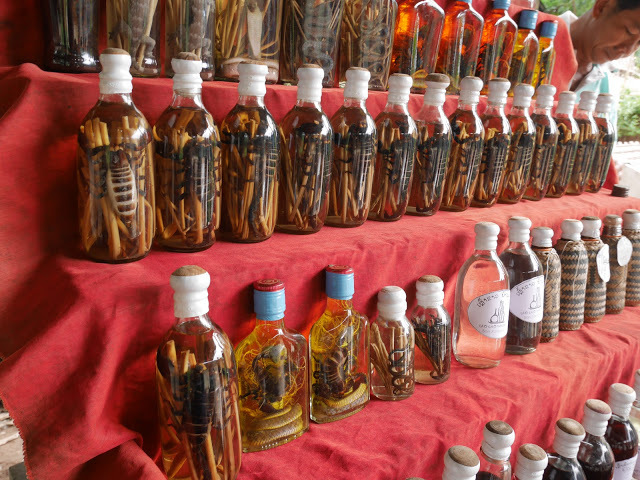 If you are even braver, why not try a bottle of local “snake wine”? 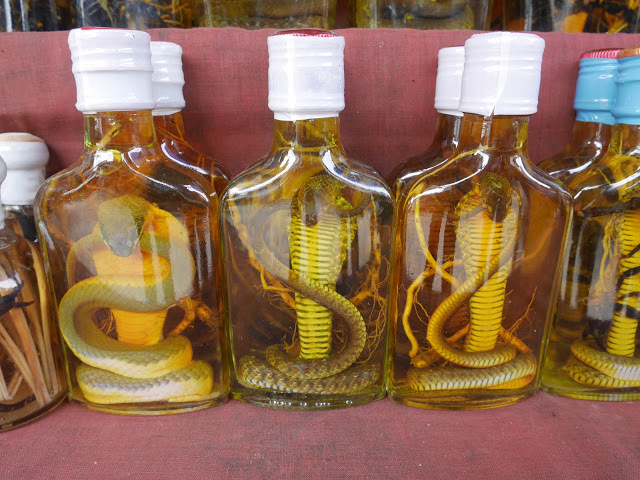 Snake wine (or, more accurately snake whisky) is made from preserving cobras, scorpions, spiders, and herbs inside small bottles of powerful rice moonshine. Though the drink is a traditional "health" and energy drink, it’s now sold almost exclusively to tourists as a souvenir. I don't think many local Lao people drink this stuff! As a matter of fact, I don’t necessarily recommend drinking it. The practice could be considered cruel and unethical, and I'm honestly not sure how safe it is to drink. Still, it’s a shocking souvenir to give to a friend back home. Are you brave enough to try a sip? How is traditional Lao rice whisky made? The rice whisky, or lao-lao, for which the village is so well-known is made by first fermenting a certain type of sticky rice in big clay jars. After the rice has been fermented into a rice wine, it’s then distilled in a large metal still, much like moonshine. After that, it can be infused with herbs (or various reptiles or arachnids) or bottled as is. Is Lao whisky safe to drink? While lao-lao has been produced locally in the same way for hundreds of years, I caution you to drink it at your own risk. There is no health standard or government organization that oversees the production of this alcohol. While I did try the whisky at the whisky village, I can't guarantee the standard to which it is made. I only tried a very small sip myself. Please use your best judgment. 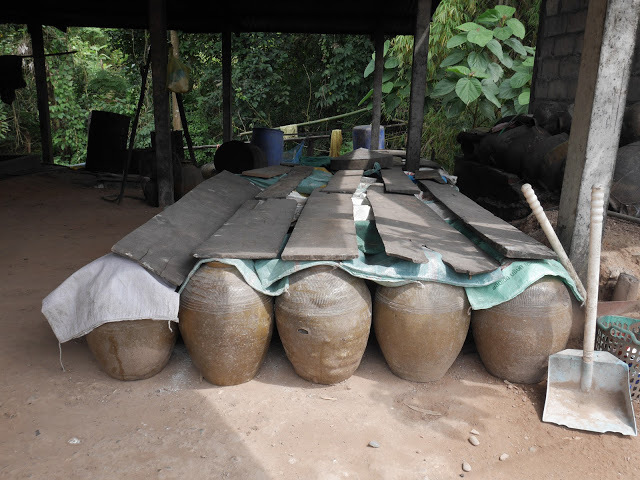 Learn more about the rice whisky making process at the Whisky Village near Luang Prabang, Laos. The tour to Pak Ou Caves includes a stop at the Whisky Village. The stop is usually short, 20 or 30 minutes. It’s enough time to explore the tiny village, which makes more than just whisky. 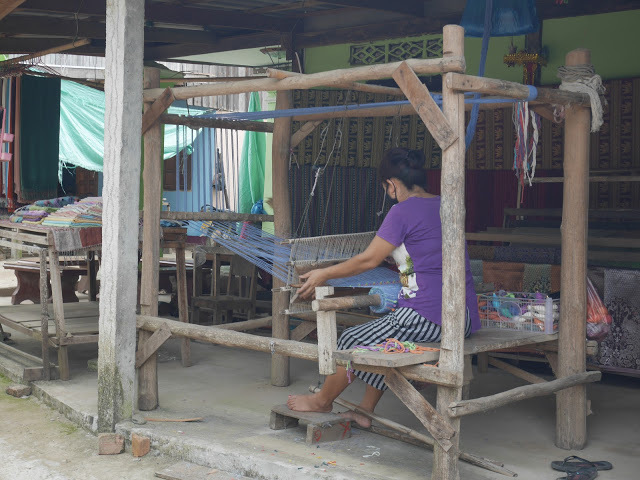 If you are lucky, you might even see a local woman weaving silk in the traditional way. A number of other handicrafts besides whisky are available for sale at local souvenir stalls if you want to help support the village. The best way to reach the Whisky Village is by boat. It takes between 90 minutes and 2 hours to reach the Whisky Village from Luang Prabang. As the Whisky Village is always a stop on the Pak Ou Cave tour, combining both into one visit is the best way to see the village. Is it worth it to visit the Whisky Village? On its own? Maybe not. The village is interesting enough, if only to learn a little bit about traditional alcohol production, but the twenty minute stop on the Pak Ou Cave tour is plenty of time to see the entire village. Since it takes nearly two hours to reach by river, it’s not really worth it to visit the Whisky Village on its own. As a part of the Pak Ou Cave tour? Absolutely! It’s an interesting diversion and a cool look at local life and traditional industry along the river. A Mekong River boat cruise and tour to the Pak Ou Caves generally includes a brief stop at the Whisky Village. 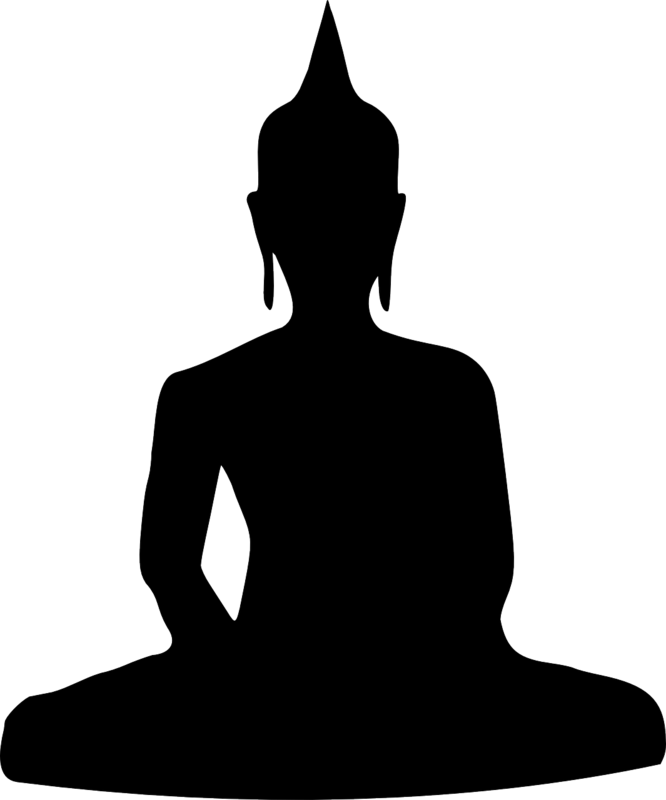 Learn more: Visit the sacred Pak Ou Caves on a day trip from Luang Prabang. Here at an ancient royal meditation retreat, thousands of old, broken, and retired Buddha statues still bless the surrounding countryside. Kuang Si Waterfall - The Kuang Si Falls are considered sacred by local people, and are especially magnificent and impressive during the annual rainy season. Tat Kuang Si Bear Rescue Centre - Learn about the illegal black bear poaching industry and efforts to combat it and protect the bears.